Bryn Mawr College (pronounced [bɾɪn maueɾ]) is a women's liberal arts college located in Bryn Mawr, a community in Lower Merion Township, Pennsylvania, ten miles northwest of Philadelphia. The name "Bryn Mawr" means "big hill" in Welsh (not "high hill," Bryn Uchel, as is often mistakenly given as the translation). Bryn Mawr is one of the Seven Sisters and is part of the Tri-College Consortium along with two other colleges founded by Quakers—Swarthmore College and Haverford College. Bryn Mawr College is one of the nation's premier liberal arts colleges. The College is known for its academics, exceptionally close relationship between students and faculty, and sense of community and shared values. In terms of academics, percent doctorates earned by graduates, placement among select professional schools, student satisfaction/quality of life, and social impact on America according to US News, Princeton Review, NSF data, the Wall Street Journal, and the Washington Monthly, Bryn Mawr has consistently ranked in the top 20 of liberal arts colleges in America, and sometimes, among undergraduate institutions (including universities) as well. In fact, The Washington Monthly ranked Bryn Mawr College as #1 college in America based on social mobility, fostering scientific and humanistic research, and how well it promotes an ethic of service to country. Sunset at Bryn Mawr College. The spire is that of Goodhart Hall, the main performance space. Bryn Mawr College was founded with the goal of educating women. This opportunity had long been denied to women as a result of traditional gender roles in western society. It reflects the inclusionary Quaker ideals of its benefactor, Joseph W. Taylor, a Philadelphian physician and member of the Society of Friends. 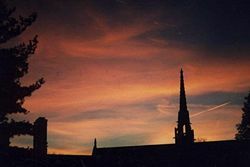 It was decided by the school's first administrators that academic excellence superseded religious dogma in a university setting so it was decided that the school would be non-denominational. Bryn Mawr College was founded in 1885. It was the first higher education institution to offer graduate degrees, including doctorates, to women. The first class included 36 undergraduate women and eight graduate students. Bryn Mawr was originally affiliated with the Religious Society of Friends (Quakers), but by 1893 had become non-denominational. The majority of Bryn Mawr students live on campus in residence halls. Many of the older residence halls are known for their Gothic revival architecture, modeled after Oxford University. Each is named after a county town in Wales: Brecon, Denbigh (1891), Merion (1885), and Radnor (1887). The exceptions are Pembroke East and West (1892), named for the House of Pembroke and its importance to William Shakespeare, (although Pembrokeshire is also a county in Wales). Rhoads North and South were named after the college's first president, James E. Rhoads; Rockefeller is named after its donor, John D. Rockefeller. The newest residence halls are Erdman (opened 1965, designed by architect Louis Kahn) and the Haffner Language and Culture House (opened 1971). In addition, students may choose to live in Glenmede (formerly graduate student housing), Perry House (the Black Cultural Center) or Batten House (an environmentally-friendly co-op). 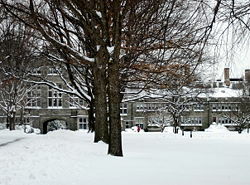 The campus was designed in part by noted landscape designers Calvert Vaux and Frederick Law Olmsted, and has subsequently been designated an arboretum (the Bryn Mawr Campus Arboretum). In 1908, John C. Olmsted designed a private garden for M. Carey Thomas adjoining the Deanery. Today this garden is modified and renamed the Blanca Noel Taft Memorial Garden. It was designed as a small, serene enclosure with two wall fountains, one with a small basin and the other with a sunken reflecting pool, another smaller reflecting pool, as well as a statuary based on designs Thomas and Garrett had seen in Italy. The decorative wall tiles were purchased from Syria. In 1960, architect Louis I. Kahn and Bryn Mawr College president, Katharine McBride, came together to create one of this century’s great buildings, the Erdman Hall dormitory. For over a year, Kahn and his assistants struggled to translate the college’s design program of 130 student rooms and public spaces into a scheme (well documented by the letters written between McBride and Kahn). The building comprises three geometrical square structures, connected at their corners. The outer walls are formed by interlocking student rooms around three inner public spaces: the entry hall, dining hall and living hall. These spaces receive light from towering light monitors. The Marjorie Walter Goodhart Theater houses a vaulted auditorium designed by Arthur Meigs, two smaller spaces that are ideal for intimate performances by visiting artists, practice rooms for student musicians, and the Office for the Arts. The building's towers and gables, friezes, carvings, and ornamental ironwork were designed by Samuel Yellin in the gothic revival style. Named after Bryn Mawr's first Dean and second president, the M. Carey Thomas Library is no longer a library. Today, it is a space for performances, readings, lectures, and public gatherings. It was once the home of the Athena statue (which was damaged in 1997 due to a student theft) which is now located in a high alcove in the Rhys Carpenter Art and Archaeology Library. The Great Hall (formerly the reading room of the old Library) features a cathedral ceiling painted with geometric Renaissance patterns and tall, lead-paned windows, which flood the space with light. M. Carey Thomas Library encloses a large open courtyard called "The Cloisters," which is the sight of the College's traditional Lantern Night Ceremony. The cremated remains of M. Carey Thomas’ are in the courtyard cloister. Alumna Katharine Hepburn used to go skinny dipping in the Cloisters fountain, a fact confirmed by the source in her 1985 graduation address. A popular tradition is for undergraduates to do the same before graduating and conveniently the fountain contains chlorinated water. Named for Bryn Mawr’s late professor of Classical Archaeology, the Rhys Carpenter Library was designed by Henry Myerberg of New York and opened in 1997. The space is attached to the rear of the M. Carey Thomas Library. The entrance is a four story atrium. Names of art and archaeology faculty are on the main wall with a frieze of plaster casts from ancient Halicarnassus. Most of the stacks, study areas, lecture halls and seminar rooms were built underground. The roof comprises a wide grassy area used for outdoor concerts and picnics. The building won a 2001 Award of Excellence for Library Architecture from the Library Administration and Management Association and the American Institute of Architects. Carpenter Library also houses the College's renowned collections in Classical and Near Eastern Archaeology, History of Art and Classics. The building also contains a large lecture hall and a seminar room. Students at Bryn Mawr are required to complete divisional requirements in the social sciences, natural sciences (including lab skills) and humanities. In addition, they must fulfill a two-year foreign language requirement, a quantitative skills requirement, and a College Seminar requirement. Bryn Mawr undergraduates largely govern themselves in academic and social matters. Their Self-Government Association, formed in 1892, is the oldest such organization in the United States. A significant aspect of self-government is the Academic Honor System (honor code). Along with Haverford College, Bryn Mawr forms the Bi-College Community. Students in the "Bi-Co" enjoy unlimited cross-registration privileges and may choose to major at the other institution. The two institutions join with Swarthmore College to form the Tri-College Consortium, opening the Swarthmore course catalog to interested Bryn Mawr students as well. Free shuttles are provided between the three campuses. There is the Blue Bus between Bryn Mawr and Haverford College, and a van, known to the students as the "Swat Van," that goes between the three colleges. In addition, the group is affiliated with the University of Pennsylvania through a special association known as the Quaker Consortium, allowing Bryn Mawr students to take classes there. Additionally, Bryn Mawr students in the Growth and Structure of Cities department may earn a Bachelor of Arts at Bryn Mawr and a master's degree in city planning at Penn through the 3-2 Program in City and Regional Planning. The four major traditions at Bryn Mawr are Parade Night, which takes place on the first night of the academic year to celebrate the start of the year and introduce underclasswomen to upperclasswomen; Lantern Night, which takes place in late October or early November, during which sophomores present freshwomen with lanterns symbolizing the transmission of knowledge; Hell Week, which takes place in mid-February and is designed as a period of bonding; and May Day, which takes place on the Sunday after classes end in the spring semester. Step sings, when students bring their class lanterns and congregate at Taylor Hall, singing songs such as "Bread and Roses," occur around these events as well. The two traditions mistresses of the College, elected by the student body, are in charge of organizing and running traditions. In addition to events, Bryn Mawr's traditions extend to superstitions around the campus, some of which date back to the opening of the college in 1885. These superstitions include the moon bench, kissing on which is said to doom any relationship and the Rock Arch, kissing under which is fortifying of a relationship. A number of Bryn Mawr alumnae have gone on to become notable in their respective fields such as Drew Gilpin Faust, the first woman president of Harvard University, modernist poets H.D. and Marianne Moore, and the actress Katharine Hepburn. Notable faculty include Woodrow Wilson and Richmond Lattimore. ↑ History Bryn Mawr College. Retrieved January 27, 2008. ↑ Campus Plan Bryn Mawr College. Retrieved January 27, 2008. ↑ Goodhart Theater Bryn Mawr College. Retrieved January 27, 2008. ↑ The First 300 Lower Merion Historical Society. Retrieved January 27, 2008. ↑ Park Science Center Bryn Mawr College. Retrieved January 27, 2008. ↑ Activities Bryn Mawr College. Retrieved January 27, 2008. History of "Bryn Mawr College"
This page was last modified on 7 July 2016, at 15:39.